If you’re a Respiratory Therapy student who is looking for a study guide that is loaded with pneumothorax practice questions, then you’re in luck and this is definitely the post for you. 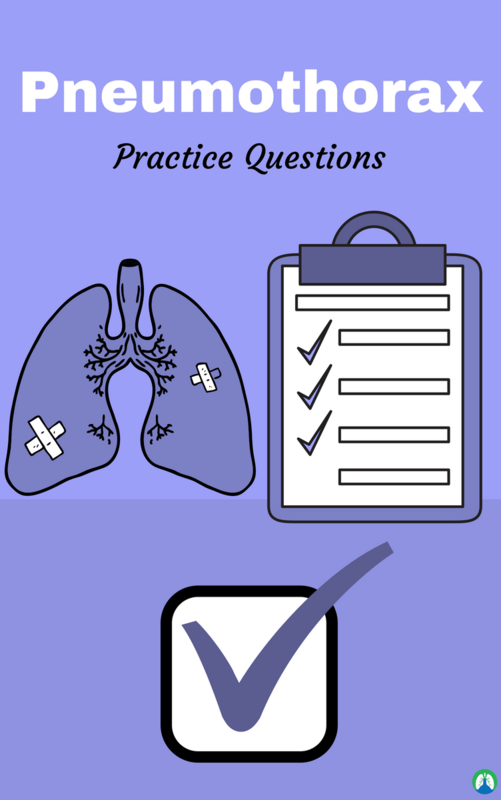 As you will see below, we listed out some of the absolute best practice questions that will teach you everything you need to know when it comes to treating patients with a pneumothorax. This is definitely something you will need to know, not only in Respiratory Therapy school but also for the TMC Exam as well. Not to mention, you will need this information once you finally start seeing your own patients as well. That is why it’s very important that you develop a good understanding of a pneumothorax now so that you can have it in your arsenal for years to come. Let’s get started! 1. What is a pneumothorax? It is an abnormal collection of gas in the pleural space that separates the lung from the chest wall. It occurs when air gains access to and accumulates in the pleural space. It is a collection of free air in the chest outside the lung that causes the lung to collapse. 2. What are the three types of pneumothorax by etiology? Primary spontaneous, secondary spontaneous, and traumatic. 3. What causes a primary spontaneous pneumothorax? It is idiopathic. There is a development of subpleural blebs at the lung apices. 4. What can cause a secondary spontaneous pneumothorax? Lung diseases like acute severe asthma, cystic fibrosis, pneumonia, sarcoidosis, pulmonary fibrosis, and lung cancer. 5. What are the two parts of the pleura and what happens to them in a pneumothorax? Visceral and parietal pleura separate. 6. What does a pneumothorax tend to enhance? It enhances pulmonary recoil or collapse, and chest wall expansion away from each other. 7. What happens to the lungs in a pneumothorax? They collapse, which compresses the alveoli, and atelectasis ensues. 8. What occurs in a severe case of pneumothorax? The great veins may become compressed causing a diminished cardiac venous return. 9. What kind of pulmonary disorder is a pneumothorax? 10. What are the major pathologic or structural changes caused by a pneumothorax? Lung collapse, atelectasis, chest wall expansion (in the case of a tension pneumothorax), compression of the great veins, and decreased cardiac venous return. 11. What are the more common ways gas can gain entrance to the pleural space? Perforation of visceral pleura, chest wall, and parietal pleura. 12. What causes air to enter the pleural space from the lungs? 13. During a pneumothorax, which way can you expect the trachea to shift? The trachea will shift away from the affected side. 14. What are more rare causes for air to enter the pleura from the atm? Through an esophageal fistula or a perforated abdominal viscus. 15. What is the third way air enters the pleural space that rarely happens? From gas-forming microorganisms in an empyema in the pleural space itself. 16. What occurs in the presence of an esophageal fistula or a perforated abdominal viscus, chest wall, or parietal pleura? Air enters the pleural space from the atmosphere. 17. What is your first thought for how to treat a pneumothorax? The insertion of a chest tube. 18. What is a closed pneumothorax? Gas in the pleural space is not in direct contact with the atmosphere. 19. What is an open pneumothorax? Pleural space is in direct contact with the atmosphere and that gas can move freely in and out. 20. What is a tension pneumothorax? Tension pneumothorax is a type pneumothorax in which the intrapleural pressure exceeds the intra-alveolar pressure, creating a formation of a one-way valve leading to increased intrapleural pressure. Air enters the pleural cavity but cannot escape. Air accumulates in the pleural space with each breath and gets trapped there and is associated with the formation of a one-way valve at the point of rupture. 21. What type of pneumothorax is caused by an injury? 22. What pneumothorax is caused without an underlying origin? 23. What pneumothorax is caused by a medical procedure? 24. What is a traumatic pneumothorax? Penetrating or crushing wounds to the chest wall. 25. How is a penetrating wound traumatic pneumothorax classified? 26. How is a crushing traumatic pneumothorax classified? When a crushing chest injury occurs, the pleural space may not be in direct contact with the atmosphere, but the sharp end of a fractured rib may pierce or tear the visceral pleura. This may permit gas to leak into the pleural space from the lungs. Technically, this form of pneumothorax is classified as a closed pneumothorax. 27. What is the other name of traumatic pneumothorax? 28. What may be the result of a piercing chest wound? Closed (valvular) or tension pneumothorax through a one-way valve-like action of the ruptured parietal pleura. 29. What happens in a tension pneumothorax? Gas enters the pleural space during inspiration but cannot leave during expiration because the parietal pleura (or more infrequently, the chest wall itself) act as a check valve. This condition may cause the intrapleural pressure to exceed the atmospheric pressure in the affected area. 30. What is important to know about tension pneumothorax and why? This form of pneumothorax is the most serious of all since gas continues to accumulate in the intrapleural space and progressively increases the compressing pressures on the lungs and mediastinal structures of the affected area. 31. What is the flow of gas in a crushing wound traumatic pneumothorax? Leak into pleural space from lungs. 32. What is a spontaneous pneumothorax? Pneumothorax that occurs suddenly, without obvious underlying cause and without preceding trauma or precipitating event. This type of pneumothorax is further subdivided into primary and secondary. 33. What kind of pneumothorax is secondary to pneumonia, TB, and COPD? 34. What conditions on a lung’s surface can cause a spontaneous pneumothorax and in what demographic group does it often occur? Ruptures of a small bleb or bulla on the lung surface, common with tall individuals between the ages of 15 and 35 years old. 35. What can a spontaneous pneumothorax from ruptures or small blebs result from? High negative intrathoracic pressure and mechanical stresses that take place in the upper zone of the upright lung. 36. Spontaneous pneumothorax can act like what, how, and why does this technically classify it as a tension pneumothorax? Air from the lung parenchyma may enter the pleural space via a tear in the visceral pleura during inspiration but is unable to leave during expiration because the visceral tear functions as a check valve. This condition may cause the intrapleural pressure to exceed the intra-alveolar pressure. Makes this a closed-tension pneumothorax. 37. What is an iatrogenic pneumothorax? One that sometimes occurs during specific diagnostic or therapeutic procedures. 38. In what situation are iatrogenic pneumothorax always a hazard? During positive-pressure mechanical ventilation, particularly when high tidal volumes or high system pressures are used. This is particularly common in COPD and in human immunodeficiency virus (HIV)-related acute respiratory distress syndrome (ARDS). 39. What vital signs are increased in a pneumothorax? Heart rate, cardiac output, blood pressure, and respiratory rate. 40. What chest assessment findings are present in a pneumothorax? Hyperresonant percussion note over the pneumothorax, diminished breath sounds over the pneumothorax, tracheal shift away from the affected side, displaced heart sounds, increased thoracic volume on the affected side, and particularly in tension pneumothorax. 41. What kind of chest radiograph is present in a pneumothorax? Increased translucency, mediastinal shift to unaffected side in a tension pneumothorax, depressed diaphragm, lung collapse, and atelectasis. 42. What is the main determinant of how a pneumothorax will be managed? The degree of lung collapse. 43. How is a small pneumothorax (15%-20%) managed? The patient may need only bed rest or limited physical activity allowing for reabsorption of intrapleural gas within 30 days. 44. How is pneumothorax larger than 20% managed? 45. How should a less severe pneumothorax be managed? Withdraw air by needle aspiration. 46. How should more serious cases of a pneumothorax be managed? With a chest tube attached to an underwater seal. It is inserted into the pleural cavity allowing the evacuation of air and this enhances the re-expansion of the lung and pleural adherence. 47. What is a pleurodesis? It is a medical procedure injecting sclerosant into the chest cavity in which the pleural space is artificially obliterated by the inflammation created allowing the lung to adhere to the chest cavity to prevent recurrence of pneumothorax or recurrent pleural effusion. 48. What are the parameters for a small pneumothorax? 49. What is the parameter for a large pneumothorax? 50. Where should the tube in a thoracostomy chest tube be placed and why? Because air rises, the tube is usually placed anteriorly near the lung’s apex, above the rib to avoid injury to the vessels and nerve that run under the ribs in the costal grooves. 51. What pressures are needed if gentle suction is applied to a chest tube? -5 cm H2O usually but no more than 12 cm H2O. 52. Why is oxygen therapy used in a pneumothorax and what is the consideration in its use? To treat hypoxemia, decrease the work of breathing, and decrease myocardial work. It should be noted, however, that the hypoxemia that develops in a pneumothorax is most commonly caused by the alveolar atelectasis and capillary shunting associated with the disorder. Hypoxemia caused by capillary shunting is often refractory to this kind of therapy. 53. When, why, and what consideration should be made when administering lung expansion therapy protocol in a pneumothorax? With caution, lung expansion techniques are commonly administered to offset the atelectasis associated with a pneumothorax in patients with chest tubes. 54. When and why would mechanical ventilation be used to treat a pneumothorax and what consideration should be made in its use? Because acute ventilatory failure may develop with a severe pneumothorax. A continuous form of this treatment with positive end-expiratory pressure (PEEP) may be required to maintain an adequate ventilatory status. Care should be taken in preventing iatrogenic pneumothorax. 55. What is the most common mechanism that can cause a traumatic pneumothorax? Penetration of the sharp bony point of a fractured rib. 56. What is the pathophysiology of a pneumothorax? A connection is made between lung air spaces and the pleural space. Air can easily enter the low-pressure pleural space. 57. What is different in the pathophysiology of a tension pneumothorax? The opening between the lung air spaces and pleural cavity works as a one-way valve. Air can enter the pleural space but cannot escape. 58. How does a primary spontaneous pneumothorax present? Asymptomatic, limited chest pain and mild breathlessness. 59. In what kind of patient do primary spontaneous pneumothoraxes appear? Young healthy men, smokers, and those with no underlying lung disease. 60. What are the clinical features of secondary spontaneous pneumothorax? Hypoxia, cyanosis, hypercapnia, sudden onset, more severe chest pain and dyspnea. 61. What are signs and symptoms of tension pneumothorax? Chest pain, respiratory distress, tachycardia, tachypnea, deviated trachea away from affected side and displacement of apex beat. 62. How is pneumothorax investigated? 63. How is a small spontaneous pneumothorax managed? 64. How is a larger pneumothorax managed? 65. How is a tension pneumothorax managed? Emergency needle aspiration and chest drain insertion. Medical emergency and immediate management by inserting a large bore cannula in midclavicular line, 2nd intercostal space and removing the needle and leave the tube in place. Large bore = 14-16 gauge. 66. What are the main types of pneumothorax? Primary, secondary, traumatic, tension and iatrogenic. 67. What is a primary pneumothorax? A primary spontaneous pneumothorax occurs without preceding trauma or precipitating event. It develops without a clinically apparent pulmonary disease. 68. What patients are most at risk of primary pneumothorax? History of cigarette smoking, Marfan’s syndrome, family history of pneumothorax, tends to be young, tall and slender men. 69. What is a secondary pneumothorax? It occurs as a complication of an underlying lung condition. 70. What patients are most at risk of secondary pneumothorax? COPD (70% of pneumothorax), cystic fibrosis, tuberculosis and pneumocystis jirovecii infection (usually HIV). 71. How does a tension pneumothorax occur? It can complicate primary, secondary spontaneous or traumatic pneumothoraxes. 72. What are the classic x-ray features of tension pneumothorax? Deviation of the trachea away from the side of the tension, a shift of the mediastinum and depression of the hemidiaphragm. 73. How does an iatrogenic pneumothorax occur? Transcutaneous needle aspiration of lung lesions, thoracentesis, endoscopic trans bronchial biopsy, central venous catheter placement and barotrauma as a result of mechanical ventilation. 74. What are catamenial pneumothoraxes? Catamenial pneumothorax is a condition of air leaking into the pleural space (pneumothorax) occurring in conjunction with menstrual periods (catamenial refers to menstruation), believed to be caused primarily by endometriosis of the pleura (the membrane surrounding the lung). 75. What are the features of pneumothoraxes? 76. What is the definitive treatment of a pneumothorax? Intercostal chest drain immediately after decompressing a tension pneumothorax and O2 therapy via non-rebreather face mask. 77. What are the signs and symptoms of a tension pneumothorax? Severe and worsening dyspnea, distressed, with rapid labored respirations, cyanosis, profuse diaphoresis, tachycardia, hyper-expanded chest, and hyper-resonance and diminished breath sounds. 78. What investigations for a patient with pneumothorax? PA CXR/expiratory film chest x-ray, check ABG, CT if occult pneumothorax is suspected and US if supine AP. 79. What can be seen in a chest x-ray of a patient with a pneumothorax? A visceral pleural line is typically identified. Lack of lung markings in large pneumothorax, lung edge may be seen in smaller pneumothorax. 80. What are the major causes of a pneumothorax? A penetrating chest wound (gun shot, stabbing), barotrauma to the lungs (when exposed to sudden contractions or expansions of air), spontaneously (most commonly in tall, slim young males), chronic lung pathologies including emphysema, asthma, cystic fibrosis; acute infections or Chronic infections, such as tuberculosis; and cancer. 81. What are the divisions of pneumothorax? 82. What makes tension pneumothorax different from non-tension? A medical emergency as air accumulates in the pleural space with each breath. 83. What makes non-tension pneumothorax different from tension? A less severe pathology because the air in the pneumothorax is able to escape. 84. What are the causes of tension pneumothorax? Penetrating trauma to the lungs and tension pneumocystis (patients with S. aureus pneumonia). 85. What is the pathogenesis for tension pneumothorax? Increase intrapleural pressure shifts the mediastinal structures to the opposite side. 86. What are the clinical manifestations of a tension pneumothorax? The diaphragm is depressed on the affected side and breathes sound absent on the affected side. 87. What is the management for tension pneumothorax? Insert needle into the pleural cavity to relieve pressure. 88. What is non-tension pneumothorax? Spontaneous, meaning there is no traumatic injury to the chest or lung. 89. What are the causes of a non-tension pneumothorax? Primary spontaneous pneumothorax: a rupture of a bulla in the lung people without any previous history of lung disease; Idiopathic (most common cause): rupture of subpleural bullae in the apex of the lung, mostly seen in tall, thin males; Marfan’s syndrome; and, Iatrogenic: needle puncture of the lung. Secondary spontaneous pneumothorax: occurs due to some of the diseases such as COPD, TB, lung cancer, pneumonia, etc. 90. What is the pathogenesis for non-tension pneumothorax? A portion of the lung collapses and pleural cavity pressure is the same as the atmospheric pressure. 91. What are the clinical manifestations for non-tension pneumothorax? Sudden onset of a pleuritic type of chest pain, absent breath sounds, and the trachea deviates to the side of the collapse. 92. What are the presentations of pneumothorax? Sudden onset of dyspnea (huffing and puffing person), maybe pleuritic chest pain on affected side: sharp pain provoked by deep inspiration (pleuritic necklace); hyper-resonant percussion on the affected side (resonant drum), and diminished breath sounds on affected side d/t air filling pleural space (distant lung sails). 93. What increases the risk of primary spontaneous pneumothorax? 94. What is the most common cause of secondary spontaneous pneumothorax? 95. What are the other causes of pneumothorax? Parenchymal destruction from malignancy (cancer crabs); M tuberculosis infection that leads to pleural or bronchial destruction (pointy cactus); pulmonary infections like pneumonia, lung abscess (rusty chest plate); high airway pressures from mechanical ventilation (forcing air into guy with air bellows); penetrating or blunt trauma (pointy spikes, blunt club); and, improper catheter insertion. 96. What happens to mediastinum in tension pneumothorax? Mediastinal structures get compressed (tension on mast, compressed) and structures, such as the trachea, get shifted away from affected lung (shifting mast). 97. Why can a tension pneumothorax lead to jugular venous distention? Obstruction of SVC (superior vena cava) leading to decreased venous return resulting in the jugular veins getting distended (dilated jug). 98. Why can a tension pneumothorax cause tachycardia? Obstruction of SVC that causes decreased venous return leading to less blood to pump then heart pumps faster to try to compensate (raised heart clock). 99. What treatment is done for a tension pneumothorax? Needle decompression and chest tube placement (rushing to lady with big needle and tube). 100. What is a hemothorax? Blood leaks into pleural cavity from a ruptured intrathoracic aneurysm (glass of red liquid). Lymph leaks into pleural space (glass of milky-liquid). 102. What are the chest percussion finding of a pneumothorax, hemothorax, and chylothorax? Pneumothorax has a hyper-resonant percussion not on the affected side, while a hemothorax and chylothorax has a dull on percussion note. 103. What are the signs symptoms of a pneumothorax? 104. For a patient with a tension pneumothorax, should performing a chest x-ray be done first? No, this is a medical emergency and you should not delay treatment. 105. How would you manage a primary pneumothorax? If shortness of breath and/or rim of air >2cm on CXR, aspirate and chest drain. Then consider discharge and outpatient review in 2-4 weeks. 106. What is the difference between a primary and secondary pneumothorax? Primary pneumothorax is without a precipitating event in the absence of lung disease while secondary pneumothorax occurs as a complication of underlying lung disease. 107. How do you aspirate a pneumothorax? Insert large-bore needle with a syringe partially filled with saline, into 2nd intercostal space midclavicular line. 108. Where do you insert a chest drain to treat a pneumothorax? 109. What is the most appropriate initial management in a patient with pneumothorax? Oxygen and aspirate using 16G cannula inserted into 2nd anterior intercostal space mid-clavicular line. 110. What are the three main causes of pneumothorax? 111. What are some procedures which may lead to iatrogenic pneumothorax? CT guided lung biopsy, transbronchial lung biopsy, and pleural aspiration. 112. What does a tension pneumothorax result in if it is left untreated? Impaired venous return and decreased blood pressure and cardiac output, leading to PEA arrest. 113. What are the risk factors for spontaneous pneumothorax? Male gender, height, smoking, and underlying lung disease. 114. How is increased height thought to contribute to a primary spontaneous pneumothorax? It causes lower intrapleural pressure at the apex, increasing the risk of bleb development. 115. What sign may be seen particularly in tension pneumothorax? 116. When can an intercostal drain be removed when using to treat pneumothorax? So there you have it! I hope that these pneumothorax practice questions were helpful for you. If you don’t fully understand the information that you just read, not to worry! I can definitely understand that it’s hard at first. Just be sure to go through these practice questions again and again until it really makes sense and you fully understand it. Thanks for reading and I wish you the best of luck, and as always, breathe easy my friend.